Vitreous enamel is an ancient technique for adding beautiful color to jewelery and other objects by melting glass and fusing it to metal. Originally developed by the Persians, artists through the ages have found myriad ways to express themselves through its versatility. 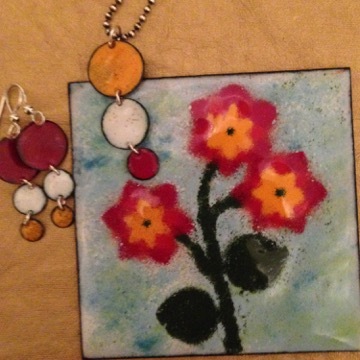 In this class students will begin their own artistic journey with enamel. Students will produce a pair of earrings, a pendant, and large pictorial image. Prior metalsmithing experience is helpful but not necessary. We'll take a break for lunch and there are places nearby to grab a bite, but you can also bring your lunch if you want more workshop time to practice. Maximum eight (8) students. All participants will be required to sign a waiver.